Bushman Equipment, Inc. has developed and manufactures a number of below-the-hook vertical lifting devices that enable processors to handle vertical coils in a safe, efficient and economical manner. Some of these heavy equipment lifting products include an automatic latch assembly that enhances efficiency by requiring just one person to operate it. The production of steel coils sometimes requires coil handling in a vertical or “eye to the sky” position. 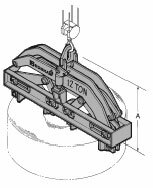 Bushman’s material handling lifting equipment is designed for equipment lifting problem solving. All of Bushman Equipment, Inc.’s vertical lifting and handling equipment – coil lifters, ID grabs and lifting tongs provide rugged service while requiring only a minimum of maintenance. All ID coil lifter units meet or exceed the latest revisions of ASME Specifications B30.20 and BTH-1, Design of Below the Hook Lifting Devices. Vertical coil lifters lift coils that are stored on spacers to permit the lifting shoes to extend under the coil for proper engagement. Optional hand chain wheels or electric motors are available to operate leg movement on ID lifters. They suit a range of coil bore and width sizes. Vertical coil lifters lift coils by supporting them on lifting shoes. An ergonomically designed hand wheel operates the coil lifter’s legs that close together to permit entrance into the eye of the coil. The lifter is lowered and one lifting shoe is placed under the coil. The operator then turns the hand-wheel to extend the legs outward until both lifting shoes are under the coil, and the legs press against the ID. The operator can now raise the coil and move it. A self-locking adjustment mechanism holds the legs in place to prevent accidental disengagement. To release the lifter, the operator safely lowers the load and then retracts the legs until both lifting shoes clear the ID. Then he raises and moves the coil lifter away from the coil. The Bushman® model 2020 ID coil lifter or coil bore grab raises coils by supporting them on lifting shoes. The ID lifter’s arms, operated by an ergonomically designed hand wheel, contract to permit entrance into the core of the coil. The coil lifter is lowered and one lifting shoe is placed under the coil. The operator then turns the hand wheel to extend the arms outward until both lifting shoes are under the coil and the arms are pressed against the ID. The coil can now be raised and transported. The legs are held in place with a self-locking adjustment mechanism that prevents accidental disengagement. Coils must be stored on spacers to permit the lifting shoes to extend under the coil for proper engagement. To release the lifter, the arms are retracted until both lifting shoes clear the ID of the coil. The ID lifter can then be raised and moved away from the coil. 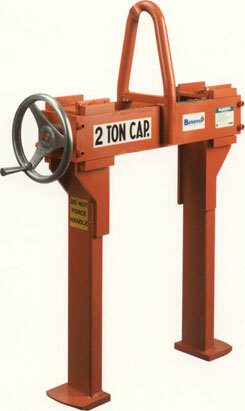 The standard 2020 ID coil lifter is available in a variety of configurations. The Model 6100 Single Rim Vertical Coil Tong lifting device handles coils by gripping the ID and OD on one side of the coil. Gripping pressure is more than three times the capacity for these mill duty lifters. 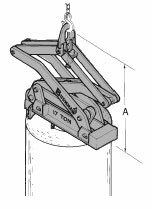 The Model 6100 below-the-hook grab hangs level when empty and has a Bushman Equipment, Inc. automatic latch for safe and efficient engagement and disengagement. Lifting pads, lined with a variety of materials from soft urethane through hardened, serrated steel pads, protect the load. 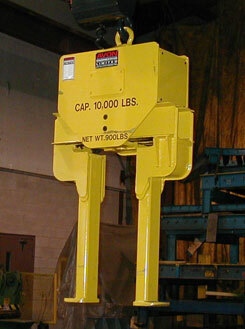 The Model 6100 Single Rim Vertical Coil Tong has a proven design that is available in capacities up to 50 tons. It can be built to suit your application. The double rim vertical coil grab handles vertical axis coils by gripping the ID and OD on both sides of the coil rim. It offers increased protection for the integrity of the coil since it distributes its clamping pressure over twice the area that a single rim vertical coil grab can cover. The outer jaws of Model 6107 double rim vertical coil tong are adjustable to accommodate a wide range of rim thicknesses. Gripping pressure is greater than three times the total load capacity. The double rim coil tong lifting device hangs level whether empty or loaded. 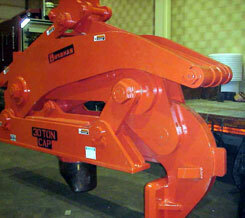 It has a Bushman Equipment, Inc. automatic latch to provide safe and efficient engagement and disengagement. Lifting pads, lined with a variety of materials from soft urethane to hardened, serrated steel pads, grip and protect the load. Please consult the factory for recommended modifications for oily or unbanded coils. The unit is designed to handle coils with axis vertical by gripping on the I.D. and O.D. at two points. Unit hangs level when latched open and empty. Gripping pressure is more than six times the total load. Lifting pads are lined with a non-marring, non-slip protection. Variations in rim width are accomplished by means of adjustable outer pad assemblies pinned in the desired location. Equipped with the Bushman automatic latch, designed to provide latching and unlatching without manual intervention. The double rim vertical coil lifter from Bushman Equipment, Inc. handles coils by gripping the ID and OD on both sides of the coil. Gripping pressure is more than three times the capacity. The grab protects the integrity of the coil by distributing the gripping force over twice the area of a single rim vertical coil lifter. The Bushman® Model 6104 coil grab handles coils with various rim sizes in applications with severely limited headroom. In contrast to the 6100 grab that requires significant vertical travel space for operation, the model 6104 engages coils by means of a hand wheel activated adjustment mechanism. The operator simply turns the hand wheel until both lifting pads contact the coil surface. The linkage assembly generates the actual clamping pressure, and a minimum of vertical movement is required. Gripping pressure for Bushman’s low headroom grab is greater than three times the total load capacity. Because of variations in coil parameters, there are no standard dimensions for the 6104 coil grab.